Just after I developed an interest in the world of fine chocolate, A Belgian TV station aired a “fly on the wall” series about Willie Harcourt-Cooze’s efforts to create his own artisan chocolate. The camera’s followed his ordeals with machinery, investments, the work on the cacao farm he owns in Venezuela up to making the actual chocolate and trying to get his product in the shop. Willie’s Wonka Chocolate Factory sure is a series you want to see if you would like a first hand view on what it means to make a decent chocolate. Ever since my wife and I saw this series, we wanted to try some of his chocolate. I’ve read a lot about it an I’ve heard other enthusiast speak about it, but there is no better way to get to know a chocolate but to try it yourself! By pure chance I walked past a chocolate shop in Bruges a while ago. Amidst countless chocolate shops selling the same mass made chocolate products, a big golden logo caught my eye! For sure, Brown Sugar, a shop in the Mariastraat in Bruges, sells Willie’s bars! I couldn’t believe my luck! I love being surprised like this. Willie takes me back to familiar ground. Madagascar. Home of very fruity and exquisite cacao able to create amazing chocolate if treated the right way. The 50g square bar is tucked in a great looking little box. 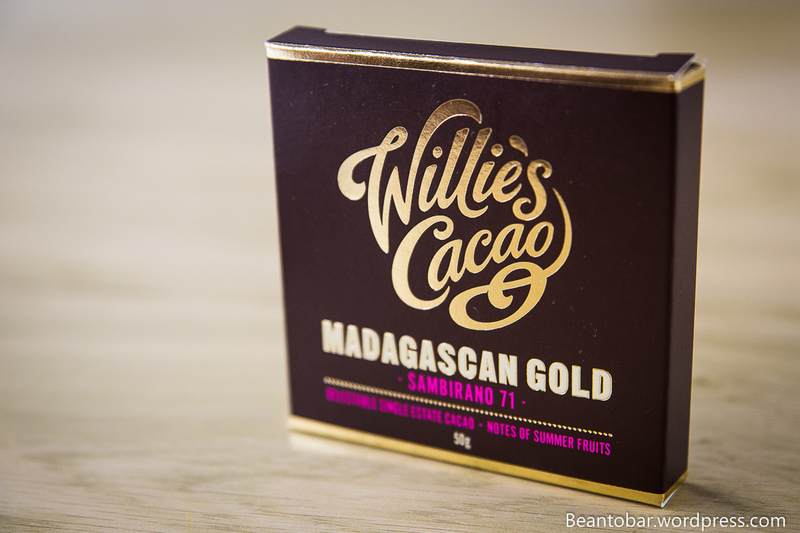 No mistakes possible, Willie’s Cacao logo shines in high gold, giving the bar a luxurious feel. Madagascan Gold and Sambirano 71 state the origin and percentage. Ingredients? Cacao mass, unrefined cain sugar and cacao butter. Pure and simple! A golden wrapper keeps the chocolate safe from harm inside the box. Color: a lighter shade of brown, mixed with a typical Madagascan red tone mingled in. Taste: The chocolate has a particular hard snap and starts of slightly sweet with a nice roasted nut aroma and a surprising mushroom type of flavor, before a dense chocolate taste comes forth. Immediately this flavor is combined with blackberry and raspberry aromas. Underneath the main flavor, a noticeable full-bodied aroma strengthens the taste experience. Well controlled tannins and wood carry the twinkling berry flavors that keep emerging out of nowhere and dance around on your tongue. 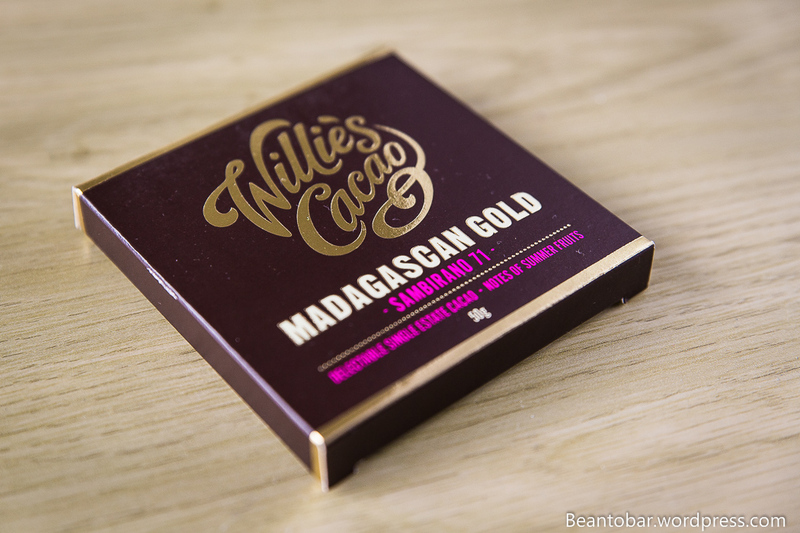 The texture is far smoother than I expected after reading other reviews of Willies bars. 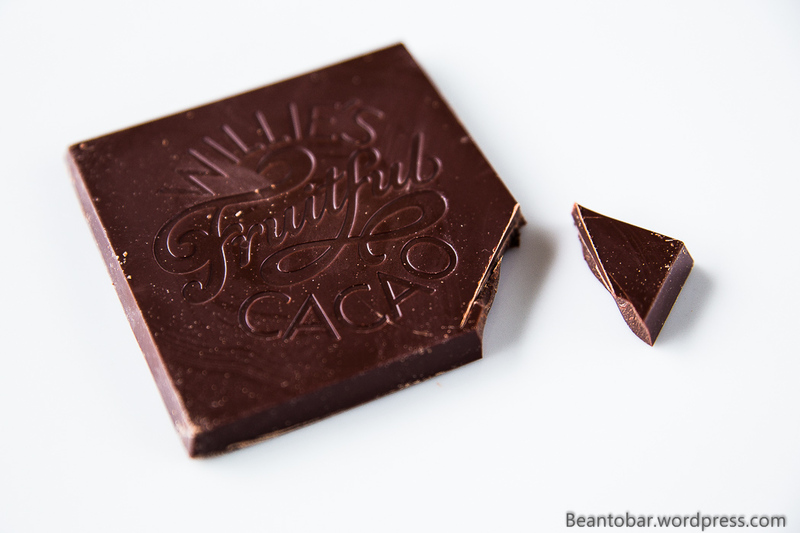 It melts beautifully and is but a tad coarser than the smoothest French style chocolate. 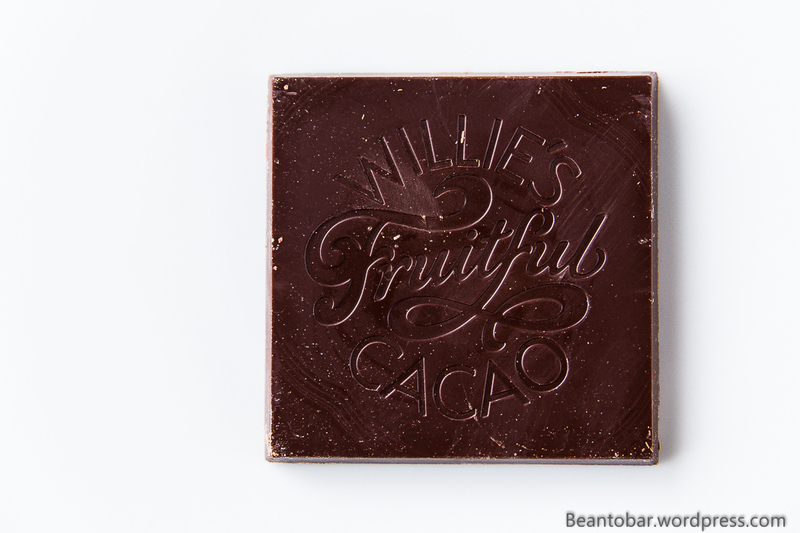 This particular chocolate is thick and lush on the tongue without ever becoming clingy or too much. Near the end of the melt, the darker earthy aromas gain in momentum a bit and even the touch of mushroom returns vibrantly. Far to quickly, the chocolate disappears entirely, but what remains is a glorious aftertaste, long and thick. It allows the roasted nut aromas from the very beginning reappear, carried by the ongoing woody chocolate aromas. Balanced in nature, this complex chocolate brings high fruity flavors and dark bold earthy aroma’s and simply combines them beautifully into an amazing piece of chocolate, captivating all the highlights of the origin I came to love so much. It has been quiet a while since I’ve experienced such vibrant fruits in a Madagascar bar. Wonderful! Mister Harcourt-Cooze, you sure know how to make a chocoholic very happy! Great review! Wilie sent me a few bars to try a couple of years ago. I enjoyed them. Still cannot find anywhere in the US to buy them. Adding to my list for when I open my shop.